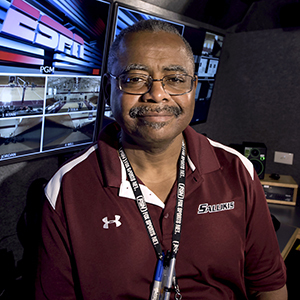 Dennis Galloway spent over 30 years working in the television industry, primarily as a freelance director of live multi-camera productions with an emphasis on sports telecasts. His client list has included: Fox Sports Net, ESPN, BET, Atlantic 10 Television Network, Executive Communications, SportsTime Ohio, MASN, Mountaineer Sports Network, MLB Advanced Media, Pittsburgh Steelers and others. His directorial experience covers many sports, including but not limited to; Major League Baseball, NHL Hockey, NFL Pre-Season football, NCAA football/basketball/soccer/volleyball/wrestling/swimming & diving, Indoor Lacrosse & Soccer and Horse Racing. He won a Regional Emmy award for directing MLB baseball and 1st place in producing a Management training videoconference.